Collins Plastics have been manufacturing acrylic displays stands and holders for over 30 yrs. 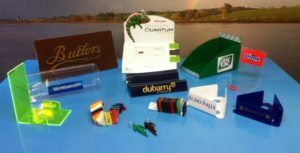 Acrylic Display Stands are popularly used for information displays, shoe displays, ticket holders, menu holders, brochure holders and display holders. We can manufacture acrylic boxes to clients’ specifications. Materials used are generally clear or coloured acrylic for clarity and gloss finish, yet PVC, coloured Foamex styrene and ABS are often used. Some of our customers who use these displays include A Wear, O2, Cadbury, Galway Crystal, Brown Thomas, Newbridge Cutlery and Bespoke Displays.